William Valle has been appointed as the new CEO of Fresenius Medical Care after former CEO Ronald Kuerbitz left the company to head up healthcare technology company Algion Health. Before becoming Fresenius’ CEO, Valle served as executive vice president responsible for the Dialysis Service Business of Fresenius Medical Care North America. He has held executive positions at several dialysis companies and has over 22 years of experience in the industry. DaVita has signed a six-year agreement that will provide the company with discounted pricing and rebates for Amgen’s Epogen and Aranesp to treat anemia in patients with chronic kidney disease. Patients with ESRD who undergo hemodialysis six times per week instead of three experience an improved health-related quality of life. Patients who received dialysis for 2 to 2.5 hours per session for five to six days per week rather than the 3.5 to 4.5 hours three days per week recovered from the session one hour faster. A study presented at Kidney Week 2016 revealed that too little or poor quality sleep are associated with greater risk of kidney failure. Study participants slept an average of 6.5 hours per night. For every extra hour of sleep, participants found a 19 percent decrease in the risk of developing ESRD. Dr. Suzanne Watnick has been named chief medical officer of Northwest Kidney Centers. Before coming to Northwest Kidney Centers, Watnick was the division chief of nephrology at Portland’s Veterans Affairs Medical Center for 14 years where she began the home dialysis program. 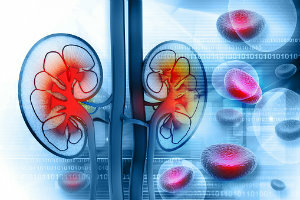 Patients with chronic kidney disease have higher out-of-pocket costs than stroke and cancer patients, a study by researchers at Loyola University Chicago and Loyola Medicine found. Chronic kidney disease patients paid a median $1,439 in annual out-of-pocket costs, compared with $770 for cancer patients and $748 for stroke patients.